Who works at the BMC? Full details of all current BMC staff. Dave has had overall responsibility for all aspects of the BMC since 2002. He was a BMC Access & Conservation Officer from 1997-2001 and worked in environmental consultancy prior to that. He's a chartered surveyor, with an MSc in Marine Science. He's originally from Northumberland but began climbing on Dartmoor and the south west sea cliffs while a student at Plymouth Polytechnic. Nick assists Dave with the running of the BMC and is also responsible for the BMC development programmes, including child protection. He is an enthusiastic climber who has climbed 8a and has left his mark with the Colton/MacIntyre route on the Grandes Jorasses. Carey's job is to develop and grow the BMC's work for hill walkers, an integral part of which is providing overall leadership for the Mend Our Mountains campaign. Having trained as a journalist, he was formerly deputy editor of The Great Outdoors magazine and is a current contributor to the Guardian's Country Diary column. With access to a teleporter he would spend most of his free time in Assynt but in reality can usually be found in the Pennines, Lake District or Snowdonia. Rob is in charge of regional access & conservation initiatives, as well as having an unequalled knowledge of access issues around the country. He's the first port of call if there's a problem somewhere with landowners, birds, military persons or anything else that shouldn't be happening. Doctor Flitcroft is responsible for managing the BMC's relationship with the Government and other countryside and recreational organisations. She is often to be found lobbying hard for the rights of hill walkers, climbers and mountaineers. She leads the BMC on policy and legislation issues affecting the cliff and mountain environment, and is responsible for replying to numerous consultation documents in England and Wales. She was once a champion athlete and has, by her own admission, spent far too much time in the wilderness. Her PhD is about peat bogs. Elfyn is the BMC access & conservation officer for Wales. He is based at Capel Curig and first port of call for all access/conservation issues in Wales. Previously a Property Manager for the National Trust for Snowdonia, he has also worked for National Parks in Snowdonia and Pembrokeshire. A first language Welsh speaker from a hill farming family, he has been climbing and mountaineering all over the world since age 11. Zoe runs all the BMC’s national and international competitions. She has worked in the industry for a good few years now and enjoys nothing better than climbing, crossfit or kiting! Lucinda's role is to support talented youngsters along their journey in the climbing world, whether that be through competition or out on rock. Ex British Boulder and Lead champ and GB Team member, Lucinda has worked as a coach and teacher for the last 18 years. When time permits, Lucinda enjoys running, yoga, skiing and drinking Yorkshire tea . Tim works alongside Lucinda to set up programmes to develop youth climbing. Jon works as a link officer between the BMC and Mountain Training England (MTE), contributing to the development of new awards and the support of existing ones. He is responsible for BMC publications and events with a good practice message. In a previous life he worked at Plas y Brenin and holds the MIC and IML awards. Niall is the man to praise for the world class guides the BMC is currently producing. A media celebrity, with no fear of either the limelight or an hilarious (but risque) joke in front of a packed audience of dignitaries; he defies all attempts at description. Becky successfully manages major BMC events including the International Meet. She can usually be found either at the dinner table or clinging tenaciously to a crag somewhere. Dan provides advice and guidance about safety related mountaineering equipment. He helps the Technical Committee investigate equipment failures, and to educate climbers and mountaineers about how to use and care for their equipment. He now knows quite a lot about bolts, despite hardly ever going sport climbing. Jane is the Clubs, Huts & Volunteers Development Officer. She works with BMC clubs to support them to grow and develop, and supports the work of the BMC Clubs' Committee and the BMC Huts Group. Jane has worked in sports development for many years, is an active member of her local mountaineering club and can even be found on rock (when it’s not raining!). James is from the Lake District and did a lot of climbing and hill walking there before moving to North Wales to study Environmental Science in 2002. He worked for 7 years at Plas Y Brenin, The National Mountain Centre in Wales and for the last 3 has worked for himself and Phill George on both rock climbing courses and ML training and assessments. He has taken up the position of BMC Youth & Equity Officer to help give youngsters from urban areas more climbing and outdoor opportunities. He’s also keen to try and set up some more BMC Youth Meets. Amii supports the Competitions Officer and the Training Officer with comps related tasks and the co-ordination of our FUNdamentals courses. Amii oversees the office stationery supply. When Amii is not at the BMC you will find her bouldering either at the local climbing wall or crag. Perhaps the most high pressure job in the building, but you'd never know it from looking at him. Cool, calm and collected, he gave Daniel Craig a good run for his money at the James Bond auditions. Alan works closely with Kate Anwyl to ensure data compliance. Alan's trusty sidekick, and responsible for day to day management of receipts and payments, including the petty cash. She has no idea about climbing & mountaineering, but is frighteningly good at hassling people for invoices & remittances! Hannah manages the BMC online shop – contact her if you'd like to get your products featured in there. She likes bouldering and growing sunflowers. Kate provides HR and office support to all the staff and is PA to the CEO, ensuring good governance, data compliance and health and safety. She's the secretary for the Board of Directors and and organises various events, including the annual AGM. Prior to joining the BMC, Kate worked for the 2002 Manchester Commonwealth Games and the 2000 Sydney Olympics. Tony's role includes the co-ordination of BMC house style on publications, as well as press and event support. He also supports the promotion of BMC area meetings and is the secretary for the National Council. Suzanne provides administrative support to the BMC’s HR function and also to the BMC President. She also spends time liaising with the BMC’s partners and sponsors. Lucy’s role includes ensuring good governance, compliance with legislation and keeping the Board of Directors in line as Company Secretary. Previous lives have included being a corporate lawyer and teaching English as a foreign language in Slovakia, Spain and Argentina. Lucy has no knowledge of mountaineering but is a keen hill walker and likes nothing more than going for a hike with her camera. Alex runs the Marketing and Communications crew who bring you everything from carefully crafted tweets to magnificent multi-day events. He especially likes Summit magazine and BMC TV. He is developing a weird and unexpected interest in winter climbing. Pete is the writer extraordinaire, that is, when he isn’t reading or watching climbing stuff online. Aside from producing reams of impeccable copy, he is also known for being an avid rock climber and a scuba diving instructor, albeit preferably when in tropical seas. Jon is our digital marketing guru, inventing new and exciting ways to improve your interaction with the BMC online. He likes bouldering, live music and ale (ideally all in the same day). Emma helps market our campaigns and attends BMC events making sure everything runs smoothly. In her spare time she is always looking for ways to get active and outdoors and is always looking for the best view, whether from the top of a climbing wall or a mountain peak. Alvin is responsible for keeping the systems at the BMC running and maintaining the membership database. Whilst outside the office he can normally be found somewhere out in the wilderness. Tim is responsible for asking people whether they have tried turning it off and on again. In his spare time he can often be found hanging (or falling) off bits of limestone in the Peak. Lynda’s role is the management of the BMC’s Membership and Insurance products. She also manages the membership team and between them they are responsible for providing a quality service to all members. If you need to chat about any aspect of membership or insurance then Lynda’s your contact. Clonagh helps with BMC Memberships, Direct Debit Schemes, Clubs and Information. She has recently had a major birthday, but refuses to say which it is. Her colleagues have decided that she doesn't look a day over 29, or maybe 39. Jim works on insurance and relishes high altitude queries. He enjoys kayaking, mountain biking, hill walking and mountaineering, as long as there's an enormous pie to look forward to at the end of the day. Arun is a black belt master of the Membership Database and almost certainly knows where you live (without even looking it up). Josh helps with BMC Memberships, Direct Debit Schemes and Insurance and is the first point of contact for many of the BMC's members. He enjoys scrambling and long distance backpacking and is currently working towards his Mountain Leader Awards. Betty works on Membership Services Online (MSO) and membership. She likes cycling, growing vegetables, knitting, cats and cake. 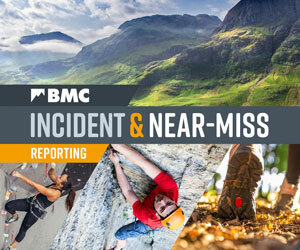 The BMC is the national representative body that champions the interests of climbers, hill walkers, mountaineers and ski mountaineers in England and Wales; we are also recognised by government as the national governing body for competition climbing. Lots of people are vital to the BMC’s ability carry out its functions. Find out who sits on the BMC's Board of Directors, and a little bit about their professional backgrounds and outdoor interests. It's hard to put a label on the newly appointed chair of BMC Cymru, Kate Worthington. But as she runs her own outdoors company and is actively involved in mountain-related clean-up initiatives, such as the Real Three Peaks Challenge, there's no question that her interests and values are entrenched in the outdoors. Read on to find out more about her plans for Wales.